The Republican presidential candidate says he will boost America’s economic output, create millions of new jobs, and put coal miners back to work. But the windfalls Trump touts originate from a report commissioned by a nonprofit with ties to the energy industry and whose findings rely on a forecasting model that often overstates the benefits of increased drilling, according to economists who have researched the U.S. shale oil and gas revolution. Immigration and trade have dominated much of the policy conversation this campaign season, but the next president will take office at a crucial time for the energy industry. America’s revolution in high-tech oil production has been sidetracked by — and has contributed to — a two-year crude price rout that has bankrupted dozens of domestic energy companies. Those figures come from the Institute for Energy Research, a nonprofit that advocates for a free-market approach to energy. It typically casts fossil fuels as the most economic form of energy generation, promotes research that says green energy jobs are unsustainable, and claims there is an “enormous volume of sensationalized, simplistic and often plain wrong information” on climate change. Secondly, fossil fuels are the most economic form of energy generation; green energy jobs not just unsustainable, they are a boondoggle and a drain on our economy; and there absolutely is an “enormous volume of sensationalized, simplistic and often plain wrong information” on climate change. If this is the “economists” point of contention, they are wrong. The Alaska National Wildlife Refuge includes a barren stretch of coastal tundra known as ANWR-1002. ANWR-1002 is Prudhoe Bay’s next-door neighbor. Geologically speaking, it would almost be regarded as a “step-out” from Prudhoe Bay. The USGS estimates the P-mean recoverable resource potential of ANWR-1002 assessment area to be in the neighborhood of 10 billion barrels of crude oil. Which means that the oil & gas industry would probably find about 40 billion barrels, if we were allowed to look. At $45/bbl, 10 billion barrels of crude oil is worth $450,000,000,000… Nearly half-a-trillion dollars. The opening of ANWR-1002, all by itself, would generate a lot of economic activity and the Treasury would collect a lot of royalty and tax revenue. Sounds like a win-win. On top of that, the failure to open ANWR-1002 soon will eventually force the premature shutdown and dismantling of the Trans Alaska Pipeline System (TAPS). A premature end to TAPS would strand about 30 billion barrels of oil and 137 trillion cubic feet of natural gas under Alaska and its OCS (outer continental shelf). • The Trans Alaska Pipeline System’s (TAPS) minimum flow rate of about 300,000 barrels of oil per day will be reached in 2025, absent new developments or reserves growth beyond the forecasted technically remaining reserves. An Alaska gas pipeline and gas sales from the Point Thomson field and the associated oil and condensate would provide another boost to oil production and extend the life ofTAPS for about one year to 2026. 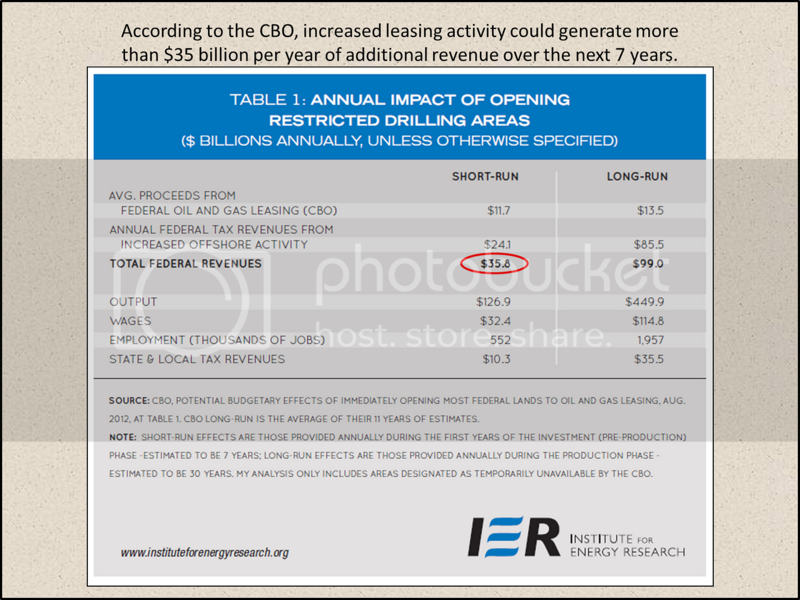 A shut down of TAPS would potentially strand about 1 billion barrels of oil reserves from the fields analyzed. • For the complete study interval from 2005 to 2050, the forecasts of economically recoverable oil and gas additions, including reserves growth in known fields, is 35 to 36 billion barrels of oil and 137 trillion cubic feet of gas. These optimistic estimates assume continued high oil and gas prices, stable fiscal policies, and all areas open for exploration and development. For this optimistic scenario, the productive life of the Alaska North Slope would be extended well beyond 2050 and could potentially result in the need to refurbish TAPS and add capacity to the gas pipeline. • The forecasts become increasingly pessimistic if the assumptions are not met as illustrated by the following scenarios. 1. If the ANWR 1002 area is removed from consideration, the estimated economically recoverable oil is 29 to 30 billion barrels of oil and 135 trillion cubic feet of gas. 2. Removal of ANWR 1002 and the Chukchi Sea OCS results in a further reduction to 19 to 20 billion barrels of oil and 85 trillion cubic feet of gas. 3. Removal of ANWR 1002, Chukchi Sea OCS, and the Beaufort Sea OCS results in a reduction to 15 to 16 billion barrels of oil and 65 trillion cubic feet of gas. 4. Scenario 3 and no gas pipeline reduces the estimate to 9 to 10 billion barrels of oil (any gas discovered will likely remain stranded). Some combination of these hypothetical scenarios is more likely to occur than the optimistic estimates. At $45/bbl, 30 billion barrels of oil is worth $1.35 trillion. At $2.70/mcf, 137 TCF is worth about $370 billion. $1.7 trillion sounds like real money to me… And this is just for the Alaska North Slope and northern OCS regions. That’s about $60 billion per year of government revenue… Just from taxes and royalty payments. So, the economic activity which generated those government revenues would have to be at least a bit larger. At $45/bbl, 974 billion barrels of crude oil (and high grade refinery stock) is worth $43.8 trillion dollars… Almost enough money to totally decarbonize US electricity generation. Even if it took 100 years to find, produce and sell that oil that still works out to $438 billion per year. 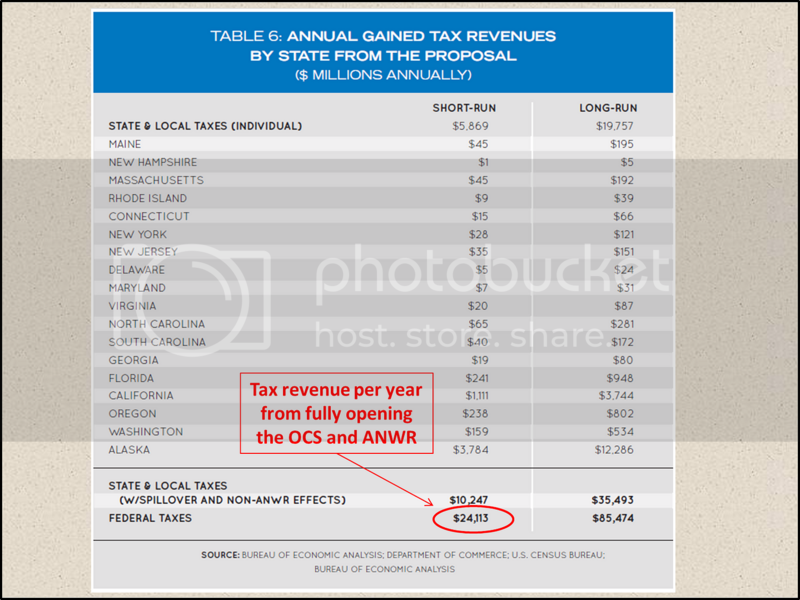 $438 billion in gross revenue will drive an awful lot of economic activity. So, what exactly, do the “economists” take issue with? “This is not academic research and would never see the light of day in an academic journal. The pioneering research … from years ago is rarely employed any more by economists,” said Thomas Kinnaman, chair of the Economics Department at Bucknell University, who reviewed the IER report for CNBC. I wonder if Dr. Kinnaman knows that “egregious” used to mean the exact opposite of what it means today… Let’s assume he’s using the modern definition and IER’s technical assumptions aren’t wrong in any way than he can identify. So, what’s his beef? but he noted that the paper makes no attempt to weigh the environmental and social costs of opening federal lands against the benefits. He is taking issue with IER’s failure to consider phony economic metrics in their analyses. I wonder if he endorsed HRC’s fantasyland energy proposals.